For generations Yamaha's portable keyboards have stood out to be the best. The Yamaha PSR-E463 Portable Keyboard is testimony to the consistent quality that is produced by this creative manufacturer. With over 750 high quality voices, real-time controls, USB audio recording and effects and tons of connectivity, the PSR-E463 is a performers dream machine. The PSR-E463 boasts a staggering 758 high quality voices that can cater for any musical style. These include 8 Sweet! Voices, 3 Cool! Voices, 3 Dynamic! Voices that simply have to be heard to be believed. The PSR-E463 is capable of 48 note polyphony meaning that even if you layer sounds together, you won't suffer from any note drop-outs. To play your sounds, the PSR-E463 Portable Keyboard comes complete with a 61-note touch sensitive keyboard for expressive and dynamic playing. Building on the superb internal voices, the PSR-E463 also gives you the power to manipulate DSP effects in real time. Sounds instantly become more dynamic and expressive thanks to the ability to apply filters, reverb, delays and much more. The handy pitch bend wheel also means you can emulate string bends on guitar based instruments and create some other cool effects. Over 230 Accompaniment Styles can also be controlled on-the-fly adding a huge level of depth to your performance. Just like the voices, the Yamaha PSR-E463 presents you with a huge range of styles to play with from all over the world. If you want something completely unique to you, the built in pattern function means you can create grooves from scratch! The PSR-E463 has a 5-bank quick sampling function for you to record short loops or one-shot samples that you can trigger at any time. Simply connect an audio source to the Aux input and take a sample of up to 9.6 seconds in length. Create grooves using the DJ mode or play traditionally and record your performances for up to 80 minutes in length via USB! This is a great feature to capture your music and immortalise it for future listening. 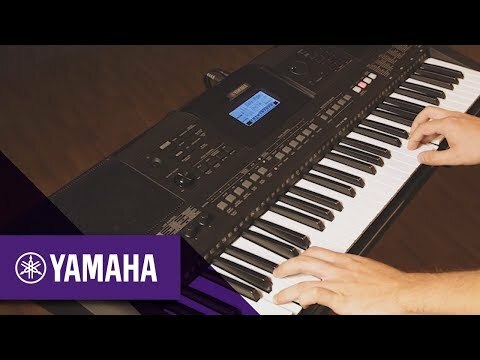 The Yamaha PSR-E463 is an incredible keyboard in its own right, but it's made even better with the available connectivity. USB memory and host functionality means you can store data on USB sticks or use the PSR-E463 with your favourite computer or iOS software. An aux input allows you to send music through the PSR-E463 utilising the crossfader and melody suppressor that can cut out vocals and melody lines so that you can play over the top of any song, a great tool to encourage learners with instant results. The Yamaha PSR-E463 Portable Keyboard is a superb performer and has lots to offer players of all styles and capabilities.